Brian Eno famously said, “An artist is now a curator.” This has been true for probably the last hundred years, more so all the time. The weekend I wrote this, the New York Times Style Magazine called it “The Age of Influence.” They’re talking about style, but style talks about everything without saying anything. It’s true that nature hates a vacuum, and it’s pointless to pretend you live in one. These days a lot of what makes things good is influences and how they are wielded. So many colors have been introduced that even the most creative act is bound to be compared before it is actually heard, felt, considered. You can speak a language no one knows, but will you make a sound? Cultures cultivate their own association with tone. Every note’s just a vibe till it strikes an ear that shutters in its wake, producing sound, seen by the brain as furniture or food. The alternative to resistance is, of course, to wear it on your sleeve like a patch you bought from your favorite band, one they made themselves in their van on the way to the show. The first track of Parquet Courts’ sophomore album, Human Performance, has Sam York of the band WALL delivering a prologue during an Enoishly announced “instrumental break,” in which she asks the listener to be moved by the sounds, “letting them pass” rather than engaging with them. When you start painting with oils, people recommend you get a palette that reflects the movement you most resonate with. Channeling your inner Hockney would have you in the brights: cadmium yellow, alizarin crimson, ultramarine blue; but if you’re feeling a little Rembrandt, you’ll need a darker blend: yellow ochre, burnt umber, ivory black. Unless you’re already good at mixing paints, this is the way to get what you’re going for. Taking hues from the Velvet Underground, Glenn Branca, David Byrne, Sonic Youth, early Beck (among many, many others), Human Performance, like Sunbathing Animal before it, pulls off that impressive act of pretending to have always been there. The instant classic pose. I can honestly see myself spinning this record when I’m 50. And it surprises me to imagine my proximity to that fate. 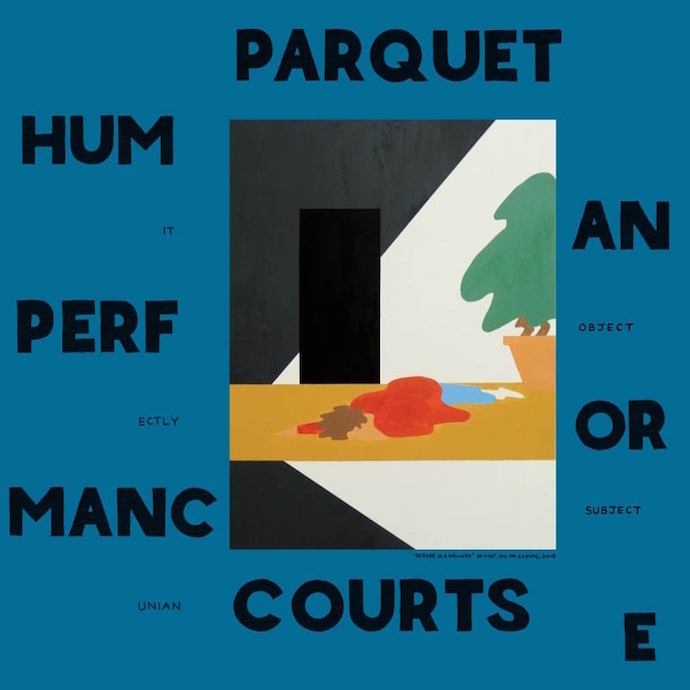 Maybe that’s because these are the sounds I so desperately want to hear in the self I’ve hardened into over the past decade, and that’s how I’ve felt about Parquet Courts since I heard them. Every push forward brings a yes of the head, and even the darker moments render a smile that doesn’t know where it crept in from. After quitting the online radio show I had done every week for a couple of years, there was an equal period in which I did not listen to new music. It’s possible I over-listened. I became more interested in making my own sounds than hearing the same old. I was especially done with those four instruments people had been playing to death for what seemed like forever, and in some ways still does. But when I heard Sunbathing Animal, my faith in those four instruments erupted like the leaves of a perennial in the haze of spring, one you forgot was even there. Human Performance builds on that prior work, as well as the other albums, especially Content Nausea, released under the Warholish pen name “Parkay Quarts,” and their recent, uncompromising Monastic Living, which sounds like something Terry Riley would make if you locked him in a room with a bag of Fritos and a guitar with an impressive peddle board. Placing all those colors over a nice sketch of an imploding sunset makes Human Performance their best piece yet. It may be singer Andrew Savage’s best cover, as well: a piece of his called “Seizure in a Hallway,” a melted human leered over by an anthropomorphized houseplant. The title is deconstructed with tiny words changing it into the alternate: “Hum it perfectly mancunian / An object or subject / E.” The LP cover is a book. The lyrics are handwritten over prints by Savage, paintings reminiscent of John Wesley, making each song a double-sided broadside, or whatever. It’s a book. And it takes the listening to the next level, as you might sit in your living room, on your couch, which may or may not be a point of pride for you, thinking of nothing but drifting in and out of this interaction of image and sound, words written and sung, enriching the experience: connected through the old wiring, frayed at the edges but still there. Like Andrew Savage’s art, the music is familiar, foreign, modern, blanked. Faces are blurred and no one is sure what room this is. It’s definitely punk, but there’s a fresh bright pop that feels more alive and less stoned than Sunbathing Animal. We don’t feel comfortable, nor alone: here alone and lost together. As he told Sterogum, “I like images that are familiar and ordinary, but hinged on an unsettling emotion.” At times, the music reflects that kind of anxiety, the kind thinking people feel when paying too much attention. But in general it promotes tuning out, un-focusing, cropping, forgetting, moving on — presumably forward, but to wherever, really. And the mix, by guitarist Austin Brown, is about as balanced on headphones through Spotify as a portable turntable blasting one tinned-out speaker on my porch, beneath the sway of an old black oak. Since taking in this album I have listened to little but the noise around me. Some of these hooks dug themselves so deep in my ears they tend to rupture at the quietest moments, carving out a sonic landscape I can wiggle my feelings to, superimposed over wherever I am — not because I have a smart phone, but because I have a brain. That may be all I ask of music, that it stick to my ribs, meld with me. As Savage says, “Nothing lasts, but nearly everything lingers in life.” If only that were typical. 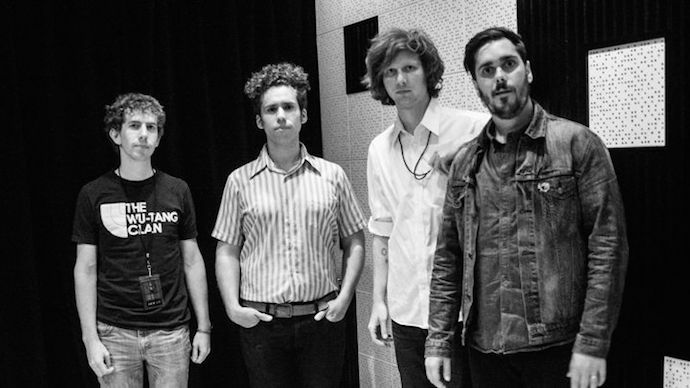 Despite my own permanent incline to the heady side of listening, Parquet Courts usually gets me to forget where I am and subsequently to want nothing more than two minutes of that floating away, found here in the anthemic “Outside.” They also tend to make me dance by myself, in my kitchen, which is how I often listen to music these days — this time to “Berlin Got Blurry,” with its poppy kiwi-rock organ punctuating the whole affair. It’s sure to score many a pool party, bbq, or road trip, as Summer does its best to boil our brains in our skulls. In the title track, Savage breaks down depression, gutting it for us to hear. “In walks the darkness / I pitch without you / asks me do I realize what I’d done / and who I’d done to / Indeed I do know / It never leaves me / just visits less often / It isn’t gone and I won’t feel it’s grip soften / without a coffin / breathing beside me / feeling its warmness / phantom affection gives a human performance.” And then we hear the chorus for the last time before the song settles into its wanting-to-believe resignation, “Witness and know / Fracture and hurt / Eyes in the fire / blink unrehearsed / shield like a house / closing its doors / curved in the dark / rinses of yours.” Bathed in the tone, all I can think is “yep,” and that seems good enough. On the last track, “It’s Gonna Happen,” Savage, accompanied by acoustic guitar, sets out in anti-folk fashion, “Earth’s plastic faces feel cold and uncommon / like they’ve got some place to be / So turn to me.” Suggesting perhaps his own discomfort with the limelight, he drifts off-key with the guitar following, and continues, “They always come around / I’m not an imposter / I’m not an imposter / at first old conventions seem staged and uncommon.” The song begins to swell with a subdued, twinkly synth, then suddenly fades. There is a shift, a pause, before the song returns with the deep bass and light drums assuring us, “It’s gonna happen every single time / Rehearse with me in mind.” That mantra is repeated as the song drifts in and out among its own branches, with alternating words and phrasings, harmonies floating in and out, and at one point Savage says, “So rehearse / it’s gonna be fine.” It seems an oblique way of saying, perhaps to himself or to his fans, this is just a performance — relax.